It’s that time of the year. You read the papers, you buy a magazine, you watch television, you check your social media and naturally you speak and chat with your friends. Christmas aside, what is the most common theme as the New Year approaches? A dictionary definition is “A firm decision to do or not to do something.”…So we are now entering the area of goal setting and motivation. In life, the only real way to be motivated is to have powerful goals that you buy into and that provide the drive (motivation), to achieve an end outcome and one that you really want. We prefer a powerful goal that spurs you on (towards motivation)…But you can have thoughts that drive you to not do something (away from motivation)…Eating chocolates? Far better that you spin it around so that the thought behind forgoing chocolates is a new look you! Wow I want to be that person! How real are goals when in reality you have been persuaded purely by external influence? Goals operate 24/7 and 365! They should be made because it’s something that you buy into with a vengeance, that really resonate with you and that the end outcome is something that you really want to achieve! A New Year whim rarely works. When creating those resolutions, turn them into goals. Picture the end outcome…What does it look like? How does it make you feel? Capture the image and store it likely a memory jog to turn to when you need reminding. Create powerful affirmations. Powerful statements and written in the present tense…So real as if it were happening now…Repeat the affirmations to yourself twice daily and for a month…Make the goal a reality! Powerful short statements that power you towards that goal. 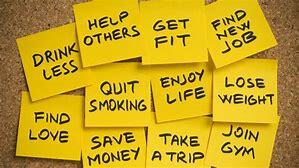 Goals are for life and not just the New Year! goals and I try to ignore the rest”.